My most memorable moments on the disc golf course come from playing pregnant on ski hill courses! I challenged my body and my mind by being able to play, compete and win while carrying my baby. Try not to overreact to a bad shot. It's only one shot out of however many you may take. If you take the anger from the bad shot with you it will affect the next throw and the next one until eventually you are in a downward spiral. I've been there; it's not that easy to come out of a bad funk. And I haven't yet mastered the art of "letting go" but I work on it constantly because I can see the difference in my throws and my overall scores. Besides, there is a ton more things to think about when golfing. I would say the easiest way to gain distance on drives, other than practicing, is to not throw super overstable discs. Throw discs that want to play in the air, not that want to start immediately turning left. Pick something less overstable and throw it smoothly with a clean snap in a form that's comfortable for you. Learn the full flight path of the disc and maximize that. It's a lot more than just a hyzer. Find plastic that you like and learn it. Learn it in a big open field with no limiting factors like trees or bushes so you can really see what that disc does under no pressure to satisfy specific lanes. The more certain you can be about the individual discs in your bag and what they do in different situations the more confidence you will have when making the decision during a round when every shot counts. 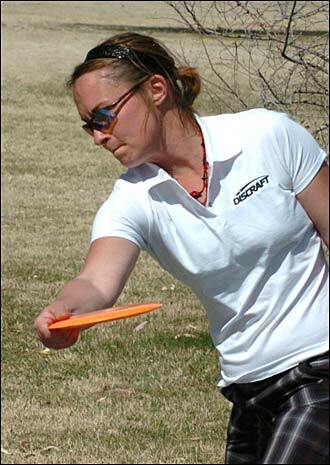 Confidence is my personal biggest factor in how well a disc will fly out of my hand. So how do I get more confidence after struggling to let go of a bad shot? I focus on the things that are certain - wind, distance, angle of my lie, and what a disc will do when released flat and hard in that wind, on that lie because I have learned each individual disc. The more factors I can be certain of the more it will help me be confident. It's a lot easier to throw focused, smooth shots when your body is not fatigued by the physical rigors of a golf round. Prepare yourself off the field by exercising, eating right and getting enough sleep. When your heart isn't pounding, back isn't aching and dogs aren't barking, your body can focus on the task at hand. At the end of a two-round tournament day (sometimes on a ski slope) there is no better satisfaction than knowing you are able to stand tall and strong right up to the final putt. Everyone has a strong part of their game and a weak part. Take some time to be honest with your game. What are its strengths and weaknesses? Be happy with the strengths and still practice those shots, but really tackle the weaker aspects! This could be anything from missing putts, rollers, anhyzers to an unlearned forehand. I knew that my forehand shots were very lacking, both in accuracy and distance. One day, I decided it was my time to learn a forehand. It's never comfortable, or even that much fun, to go out to the field and start throwing errant and weak shots. But, with enough discipline, my forehand gradually started to improve and now I throw them with confidence! Strengths and weaknesses are constantly changing, but by having the ability and will to reinforce the weak parts will only add to a better game. Shelby, MI It's like walking into a disc golf country club with mowed fairways, flower beds, rock formations, elevation changes, well maintained rough and some of the most kind people I have ever met - not to mention the spectacular shots that will challenge anyone's game. Thank you Bill McKenzie. Ludington, MI Three well laid out challenging courses within the same complex right off of Lake Michigan. Windy fairways and OB road running throughout make for cool shots. Down the road is Leviathan, another challenging course that demands many shots. On a good day you can play all four! Milford, MI A massive course that demands excellence to post a low number. Keep it in the fairway because the rough is oppressive in spots. It's a training ground for throwing shots with extreme elevation changes with or without the wind. Estacada, OR Natural beauty is to be found everywhere where you look at this park. The lush green fairways and rushing river only add to the charm of this courses technical play. I wish this park was closer, because I'd play it everyday! Whitesburg, GA Challenging, charming and most of all fun, Flyboy is not the place where you can get away with half-committed shots and lazy hyzers. Players will have to bring a full arsenal of shots to produce their best score. An amazingly unique disc golf experience! (174 gm) Bumping the Surge out the number one spot, is this bad boy! I love the versatility of this maximum distance driver! It is easy to throw and will catch some big distance if you let it turn all the way right and flex all the way back. Right out of the box, this disc is valuable and as it gets a little more beat in it only gets better! (174 gm) One of my favorite discs! I try to keep three of these in my bag at all times: two newer ones that won't flip over and a slightly beaten one that's my baby. The newer more overstable Surges are great because I use them when I want to throw long straight or long gently fading shots. The new slightly more stable Surges can be trusted to not flip over easily but have enough air under them to really go a long way. I use the "beat up" Surge for shots I don't want to necessarily throw hard or long but want to throw very accurately. It handles well at low speeds so I feel confident with it in the woods as well as out in the open. I can get my maximum distance with my beat Surge as it flips a little bit out of my hand then fades back like it never wants to come down. It's a beautiful thing! (174 gm) Wow. What a fighter. This has become my new headwind control disc as well as a big hyzer disc. I carry two of them. The more beat in of the two offers a longer shot similar to a Surge but can handle a moderate head wind. My NEW Force that I carry can handle severe head winds and rarely, if ever, wavers from its intended line! This sweet piece of plastic also serves as my low corner skipper and spike hyzer disc. It's very reliable. (174 gm) Fast and reliable, I love my Nuke. This disc went into my bag immediately upon release and has never left. I prefer my Nuke's just a little beat in, so I can easily use their full flight pattern to get maximum distance! This disc will hold a nice anhyzer line for a good portion of the flight but will reliably hyzer back when it slows down. This disc will hold the line and fetch a great distance! (174 gm) This is your go-to understable driver! It is a work horse because of its versatility right off the shelf. From the time you first let it fly, you'll see how easy it is to manipulate difficult left-to-right and straight shots with ease. My Avenger SS finds all sorts action during a round, if I'm in a sticky situation and have no run-up room? I pick this disc! It's a great stand-still thrower that doesn't require an overpowering stroke. Great for beginners and deep snow! (178 gm) If I could only throw only one disc this would be it. I love the max weight edition with a really flat flight plate. This disc can handle just about anything. I was fortunate to find Buzzz's very early in my disc golf career and they have taught me the importance of accuracy versus distance. To the left, straight up the middle or to the right - this is truly the most versatile disc in my bag and sometimes just my confidence-providing comfort disc. (178 gm) My very durable overstable midrange disc. I only throw this disc when I really can't afford any turnover mistakes. It's very reliable and will fall to the left when thrown correctly. I use it on woodsy courses when I need to get to a corner or just keep my shot in the center of a tight hyzer lane. It doesn't skip erratically or really seem to ricochet too badly when I hit trees. I have found that all Buzzz's, regardless of plastic, handle well in the wind - just keep that nose down! It's a great slower speed control disc that can be thrown for accurate hyzers as well as good midrange distances. (178 gm) When I don't want anything to fade back to the left, this is my choice. I can't get tons of distance with this disc but it has become an essential part of my arsenal. It's great for finesse shots because it's very understable not requiring much power to get it to fly straight. Add a little power and get it up in the air and you will have a superb turnover glider. (173 - 174) My putters. I spend most of my time with these discs. The soft plastic feels grippy in my hand and gives me confidence when it gets close to the chains. I try to use my Challenger for most approach shots but my favorite short-range turnover shot is with my Soft APX. It turns very easily but flattens out for a soft landing with minimal risk of skipping. I'd recommend this disc to anyone.